Coach's Corner - "Philly Special" autographed/guaranteed mint NFL Football by Nick Foles & Trey Burton! 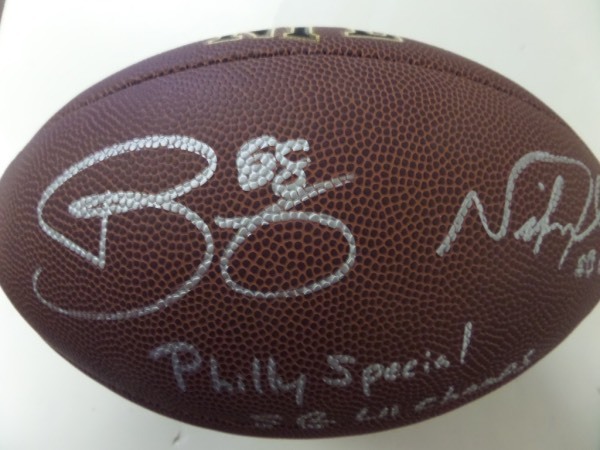 Go Back to Lot List "Philly Special" autographed/guaranteed mint NFL Football by Nick Foles & Trey Burton! This mint Wilson NFL ball is in mint shape and comes signed and inscribed by the 2 players who made this play happen in the Super Bowl! Both autographs are in silver and GORGEOUS! They have included their respective numbers and a great inscription and a must for the Eagles fan and collector!